Beautiful Friday morning with waves for those fortunate enough to be able to get into ’em. At 0600 the MHL buoy off Sydney was picking up two metres of south (165 degrees) swell with around 11-12s periods. At the point that meant typical waves were in the waist to chest range, but judging from where people were sitting, there are probably bigger sets in the mix than I saw. And the size up the beach toward the Pole was looking consistently bigger. Waves looked kinda fat to me, so the 1.57m high tide at 0930 was the likely culprit. By the time the tide’s dropping, the SW wind should be into the 15-25 kt range by the time it’s noticeably lower again. It looks as though the swell should bump up a little across the day and by tomorrow the Bureau thinks we could have large and powerful surf conditions. 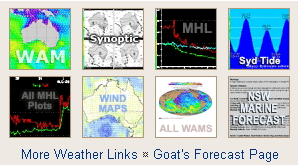 I’d have a quick read of the Goat’s forecast if you’re planning a weekend surf. Could be quite the weekend. Go well with your day and I’ll try to add a few more pics later if I can. The combination of a deep low south of Tasmania and a high pressure ridge over central Australia will maintain a vigorous westerly airstream over most coastal areas through the remainder of the week. During the weekend the ridge will extend across New South Wales as the low moves away, resulting in significantly lighter coastal winds. Southwesterly 15 to 25 knots reaching up to 30 knots in the late evening. South to southwesterly 1 to 2 metres tending southerly 2 to 3 metres during the afternoon. Mostly sunny. 40% chance of showers offshore, 20% chance elsewhere. South to southwesterly 20 to 25 knots, reaching up to 30 knots during the morning. 2 to 3 metres, decreasing to 1.5 to 2 metres by early evening. Southerly 2 to 3 metres inshore, increasing to 3 to 4 metres offshore during the morning. South to southwesterly 15 to 20 knots shifting east to northeasterly below 10 knots during the afternoon. Southerly 3 to 4 metres, decreasing to 2.5 to 3 metres during the morning.